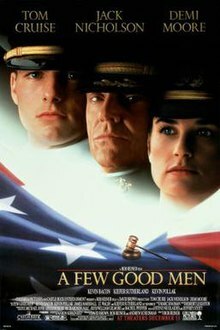 A Few Good Men is a 1992 American legal drama film directed by Rob Reiner and starring Tom Cruise, Jack Nicholson, and Demi Moore, with Kevin Bacon, Kevin Pollak, Wolfgang Bodison, James Marshall, J. T. Walsh and Kiefer Sutherland in supporting roles. It was adapted for the screen by Aaron Sorkin from his play of the same name but includes contributions by William Goldman. The film revolves around the court-martial of two U.S. Marines charged with the murder of a fellow Marine and the tribulations of their lawyers as they prepare a case to defend their clients. It was released in the United States on December 11, 1992.